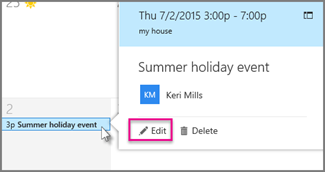 You can create, modify, or delete a meeting request or appointment in Outlook on the web. The instructions are slightly different depending on whether you're using the new Outlook on the web. Choose which version you're using to see the instructions that apply to you. An appointment is for something like a lunch, sports practice, or medical appointment that you want to include in your calendar. A meeting is a calendar event that you send to other people. You create a meeting the same way you do an appointment, but you invite attendees. Sign in to Outlook on the web. Click on the calendar at the day and time when you'd like the event to occur. Or, select New event at the top of the page. In the text box, enter a brief description of the event, including a title and location. Outlook on the web will offer suggested locations based on what you've typed. Select a location if it's accurate. If it isn't, you can enter the correct location on the event's details page. All day: Select this option if this is an all day event. Repeat: Select one of the options from the list to make this a recurring meeting or appointment, and then choose the dates when you want the series to begin and end. Remind me: Choose when you want to be reminded about the event. By default, it's set to 15 minutes before the event. Select Busy to choose how your status will appear during the event, or to make the event private. Select Categorize to choose a category for the event. If you want to invite people to the event, enter their names or email addresses in the Invite people box. You can see times they're available below the drop-down menus for date and time. Select Optional to add optional attendees. Select Response options to choose if you want to request responses from attendees or allow the meeting request to be forwarded. 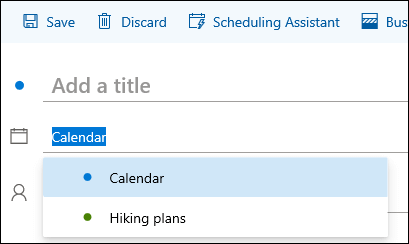 Note: If you own more than one calendar, you can choose which calendar to create an event in by selecting it from the drop-down list at the top of the new event window. In the calendar, select the calendar event, and then select Edit. This event: Choose this option to open and make changes to the event you've selected in the calendar. This and all following events: Choose this option to delete the event you've selected in the calendar and all subsequent events in the series. All events in the series: Choose this option to open and make changes to the complete series of events. Change any details for the event, and then select Save if this is an appointment you created for yourself or Send if this is a meeting with attendees. Select the meeting in your calendar and select Cancel. Add a message if you want, and select Send. This event: Choose this option to cancel the event you've selected in the calendar. All events in the series: Choose this option to cancel the complete series of events. Select the event in your calendar and select Delete. In the Delete event window, select Delete again. This event: Choose this option to delete the event you've selected in the calendar. All events in the series: Choose this option to delete the complete series of events. A meeting is a calendar event that you send to other people. You create a meeting the same way you do an appointment, but you invite attendees. At the bottom of the page, select Calendar. At the top of the page, select New > Calendar event. All day: Select this check box if this is an all day event. Private: Select this check box if you don't want others to see the details of this calendar event. Repeat: Select one of the options from the list to make this a recurring meeting or appointment, and then select the dates that you want the recurring event to span using the From and To boxes. If necessary, you can also add or remove time zones. Click Time zone > Add or remove time zones and then search for the applicable time zones. In the Reminder box, adjust the time of the reminder if you need to. By default it's set to 15 minutes prior to the event. Email reminder: Choose when the email reminder will be sent. Send reminder to: Choose Me if you only want to send the reminder to yourself (such as an appointment) or All attendees if you want to send it to everyone in the meeting. Reminder message to send: Fill this out with the message you want to send, and then click Close. Under People, enter the names or aliases of the people you want to invite. (Optional) Not sure what a good time is for everyone to meet? Click Poll for a time to meet to find times that work for you and the attendees. For more information, click what's this? on the Poll for a time to meet page. Under Attendees, click Request responses and then choose Yes or No, depending on if you want people to let you know they'll attend the meeting. The default selection is Yes. Under the Outlook navigation bar, click Save if this is an appointment you created for yourself, or click Send if this is a meeting with attendees. In the calendar, select the calendar event, such as a meeting or appointment, and then click Edit. Edit occurrence: Choose this option to open and make changes to a single calendar event. Edit series: Choose this option to open and make changes to a series of calendar events. Change any details for the meeting or appointment and then click Save if this is an appointment you created for yourself, or Send if this is a meeting with other attendees. In the calendar, select the meeting and then click Delete. Delete occurrence: Choose this option to cancel the occurrence of the meeting you selected in the calendar. Delete series: Choose this option to cancel the meeting series. Select the appointment in your calendar, and then select Delete. In the Delete event window, select Delete again. Delete occurrence: Choose this option to delete the occurrence you've selected in the calendar. Delete series: Choose this option to delete the complete series of appointments.